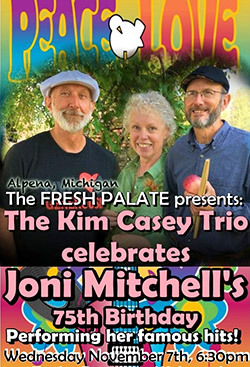 Songwriter, guitarist and Jazz vocalist, Kim Casey, will present up to 25 of Joni Mitchell’s popular songs. Throughout the show, Joni’s remarkable and familiar acoustic and Folk/Jazz music styles are faithfully presented allowing audiences to be swept along in “colored currents” of emotional reminiscence. This unique show requires the use of as many as 14 different acoustic and electric guitars, distinctly played by Kim Casey, each one alternately tuned to Joni Mitchell's song specifications. More information here.